Block unwanted tracking, hidden malware, banners, pop-ups and video ads - even on Social Media Channels! Install StopAll Ads.open source and It's free! Simply say goodbye to unwanted ads. 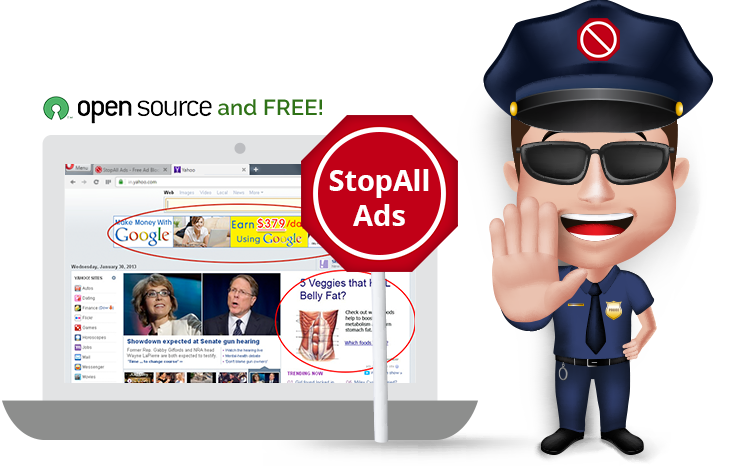 StopAll Ads is your ultimate solution to getting rid of the ads that you are forced to see but don’t want to. Simply install the extension on your browser and surf ad free. If you want to see relevant ads from sites you use frequently, you can do so too. StopAll Ads follow strict guidelines to filter ads that are potentially irrelevant and adds nothing to your surfing experience. The sites you go to tracks your movements on the web. But you might want to browse privately and avoid being tracked. Installing StopAll Ads will ensure that you get to maintain privacy and avoid tracking. With StopAll Ads, you will be able to get rid of irrelevant ads completely. We are committed to give you a better, safer, and faster surfing experience! StopAll Ads is a free browser extension which enables you to block irrelevant and repetitive ads which add no value to your surfing experience. In addition, it also helps you to avoid being tracked by websites, blocks all domains that can spread malware, and even lets you disable social media buttons while you are surfing. It is currently available on Firefox. Why should I install StopAll Ads? It is not just annoying ads that disturb you while you are surfing. Unbeknownst to you, you are exposed to malware domains while you are surfing. Your movements are also tracked on the web when you hop from one site to the other. Installing StopAll Ads will not only rid you of annoying ads but also let you block malware and disable tracking. How do I ensure my surfing data is not recorded? Advertising can be in the form of text, pictures, illustrations, embedded audio and video, or pop-up windows. They can employ auto-play of audio and video. StopAll Ads asks the user to filter the kind of ads they want/ don't want to see which means users can choose the filters for StopAll Ads after installation.